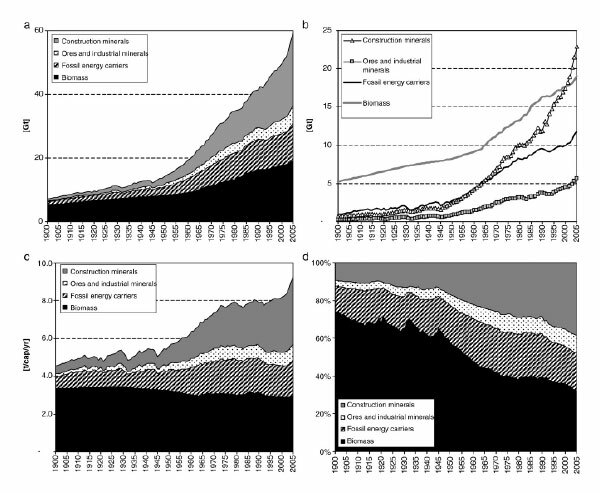 Human material use has rapidly and massively increased over the past century. This is nicely illustrated in a 2009 paper by Krausmann and others at the Institute of Social Ecology in Vienna. Fig. 1. Materials use by material types in the period 1900 to 2005. (a and b) total materials use in Giga tons (Gt) per yr; (c) metabolic rate (materials use in t/cap/year); (d) share of material types of total materials use. This expansion is due to the growth of the human economy and population. Despite advances in efficiency (i.e. the amount of materials required per unit of GDP has declined), the economy has grown faster so total materials use per capita doubled from 4.6 to 10.3 T/cap/yr. For most of the 20th century, biomass was the most significant of the four material types in terms of mass and only in the 1990s it was overtaken by construction minerals. In 2000, the 15% of the world’s population living in rich countries were directly responsible for 1/3 of global resource extraction; however this inequality is more pronounced for key materials the 15% of the world’s population living in rich countries consume more than 50% of fossil energy carriers, industrial minerals and metallic ores (a 6X greater rate for the 15% vs. the 85%). If global economic development continues its current trajectory (with a population growth of 30–40% until 2050) the will be a continuing sharp rise in global material extraction.